This isn't idle chit-chat, though. 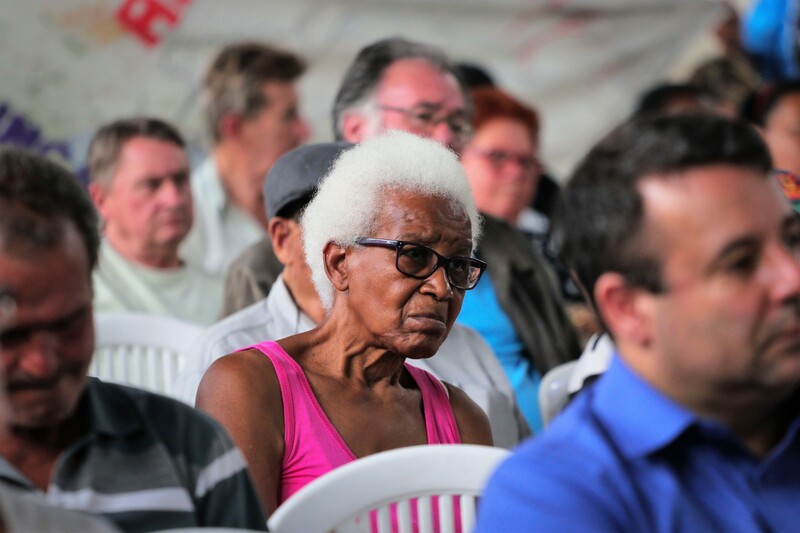 Citizens in Porto Alegre have historically had the power not only to demand city projects, but to fund them. In a system known as participatory budgeting, citizens engage in multiple rounds of debates and deliberations, and ultimately vote on how a certain percentage of the municipal budget gets spent. Porto Alegre is hailed as the birthplace of participatory budgeting. The practice has since been adopted by more than 2,700 governments throughout the world. Ironically, as the rest of the world continues to praise this Brazilian invention, the practice has fallen away in its birthplace. Porto Alegre recently suspended its participatory budgeting program. 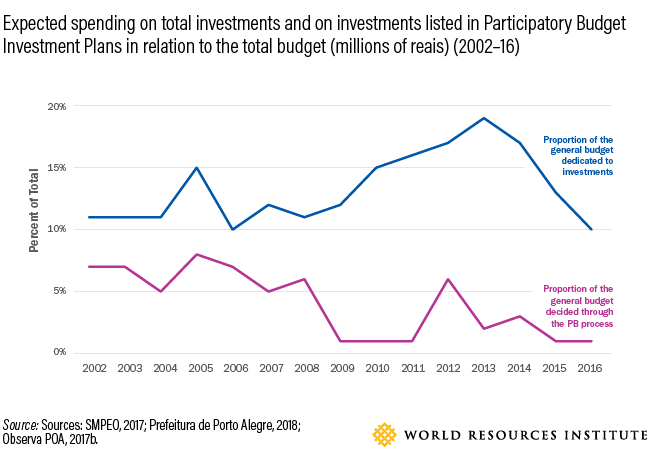 The rise and fall of participatory budgeting in Porto Alegre is the focus of the first case study in the World Resources Report, "Towards a More Equal City," offering lessons on how to protect the practice in other cities. Participatory budgeting was invented in Porto Alegre as a response to the city's rapid growth and inability to provide basic services to its residents. In 1989, following its democratic socialist ideas, the newly elected Workers' Party inverted the decision-making process so citizens decided how a portion of a city's budget was spent. The process gave a voice to the poor whose interests were usually ignored. They now had a say in which projects should be funded and built. Participatory budgeting contributed to a more equitable distribution of city services. By 1997, sewer and water connections went up from 75 percent to 98 percent; health and education budgets increased from 13 percent to about 40 percent; the number of schools quadrupled; and road building in poor neighborhoods increased five-fold. Importantly, participation in budgeting meetings grew from fewer than 1,000 people per year in 1990 to about 40,000 in 1999. Over time, the focus of the Workers' Party in Porto Alegre changed. In the 2000s, new sources of funding from the federal level become available at a scale that had not existed in the 1990s. But this funding came without requirements for citizen participation, discouraging the participatory approach. After four terms of Workers' Party government, an opposition group took over and prioritized other policy areas. PB continued, but with reduced funds allocated through open assemblies with citizens. These funds were necessary for PB to include the poor in decision-making – not only about small-scale infrastructure, but also about larger-scale projects beyond the community level, such as Conduto Álvaro Chaves-Goethe, a drainage project to prevent recurring flooding in main avenues, or Programa Integrado Socioambiental, a new sewage treatment and sanitation system. "We have pretty much the same model of participation being implemented [between 1990 and 2016], but the changing political conditions and relationships with funding for major infrastructure completely changed the meaning of how that model was implemented, emptying it out of its more inclusive character that it had in the earlier phase," says Rebecca Abers, professor of political science at the University of Brasilia. The center-right Brazilian Social Democracy Party ( PSDB – Partido da Social Democracia Brasileira took over in 2016 and, in 2017, suspended participatory budgeting for two years, citing a lack of resources and the need for reforms. While the official promise is that participatory budgeting will continue, the fear is that this is a significant setback to the open governance process that will dismantle the system all together. Without participatory budgeting, it is possible that the interests of the poor will fall off the city's agenda. Neighborhood associations, once a powerful voice from citizens, will lose the capacity to represent the urban poor in city's decision-making, elevating the influence of the private sector. Government accountability might also suffer a setback with the suspension; the loss of participatory budgeting may make it more difficult for citizens to hold politicians accountable. Even after two decades of success in Porto Alegre, the participatory process could not withstand political changes. Financial resources: Two streams of funding are necessary: Money that citizens can distribute (the participatory budget itself), and funding to support the process itself (such as outreach activities to inform citizens of how they can join). These lessons are underscored by lessons from another city in Brazil where PB stumbled: Belo Horizonte. There, as in Porto Alegre, political shifts led to the program's weakening. A new government redirected its focus towards large-scale infrastructure projects, in line with the federal government's Growth Acceleration Program. 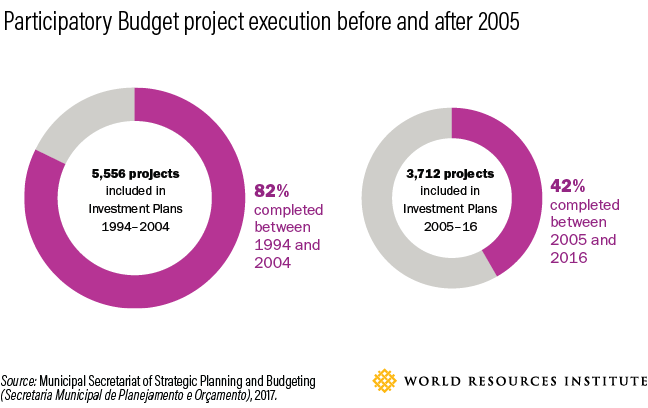 Since participatory budgeting's transformative effects are achieved though small-scale projects, the program became less relevant with the changed focus of the municipal government. Despite these difficulties, participatory budgeting remains a powerful tool to incorporate the priorities of the urban underserved into cities' agendas. Policymakers must keep in mind that participatory activities don't exist in a vacuum: Underlying institutional and political structures may also need to change. The political commitment launching the process must ensure that additional attention and political capital are spent addressing underlying structures if these efforts are to last. Finally, those undertaking participatory budgeting should expect change over time and design for it.